Take black gram in a bowl and add water. Wash the black gram thoroughly and drain the water. 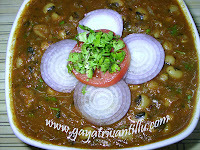 Soak the washed dal in fresh water. Take parboiled rice in another bowl and add water to it. Wash the parboiled rice and drain water. Soak the washed parboiled rice in fresh water. Soak both dal and rice for at least 6 hours or preferably overnight. Grind the soaked dal and soaked parboiled rice separately in a mixer grinder. Mix both the batters in a deep bowl and add salt. Mix the batter again well. Keep this batter aside to ferment. The fermentation takes 5 to 6 hours in summer season and a few hours more in winter season. Keep this batter bowl in a broad plate so that after fermenting, if the batter spills from the bowl it will fall in the plate which will be easy to collect and use. Peel the skins of onions and chop them finely. Wash, clean and chop the tomatoes finely. Grind green chilies & ginger in a mixer grinder coarsely. Pound the black peppers in a mortar and pestle to make a coarse powder. After fermenting, the batter increases in volume due to air. Mix the batter with a ladle and if required add some water and mix to get a thick pouring consistency batter. To the batter add chopped onions, chopped tomatoes, coarsely ground green chili ginger paste, coarsely ground black pepper, salt and chopped coriander. Heat a flat griddle. Mix the batter well and check consistency. If required add a little amount of water. To check the hotness of the griddle sprinkle some water on it and it should immediately sizzle to evaporate. Lower the flame of the griddle to the minimum. Take a ladle full of batter and add it in the centre of the griddle. Immediately spread the batter to get a flat but thick utappam. Spread oil all around and on the top of the utappam. Increase the flame to medium and cover the utappam. After a minute if you open the lid and observe that the utappam is steam cooked. Then turn the utappam with the help of a flat ladle and fry the other side. Remember not to cover the utappam second time. 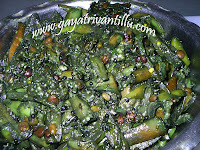 Fry for few seconds and the utappam is ready to serve. 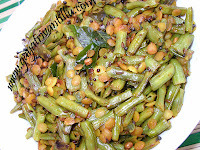 Transfer it into a serving plate and serve hot with coconut chutney. Break a piece and see the fluffy utappam is steam cooked from inside and crisply fried from the outside with the colorful stuffing. Soak the dal and boiled rice well - preferably soak them overnight. Utappam is a dish which is steam cooked like Idli and then fried like Dosa. It has a unique taste with all the colorful stuffing ingredients. Do not fry the utappam on high flame—that way it will get a dark brown color fast but will be undercooked from inside. Remember to cook and fry only on medium or low flame. Covering the utappam will allow it to get steam cooked. Utappam can be served with coconut chutney, ginger chutney, karapodi mixed with ghee etc..
To make it more colorful you can add grated carrot also. But remember, to balance between the batter and vegetables so as to enjoy the dish in its true sense. If you restrict to only one vegetable or make it the dominant vegetable our "Uttappam" would get that prefix viz Onion Uttappam, Tomato Utappam, Carrot Uttappam. If you are not able to use the entire batter in one day, you can store it in the fridge. It’s better to add vegetables as per your requirement, fresh instead of adding it to the batter and storing it.